You can use CloudWatch Events to monitor the progress of your job. STATUS_UPDATE events provide information about what phase your job is in (PROBING, TRANSCODING, and UPLOADING). For some jobs, AWS Elemental MediaConvert provides an estimate of how far your job has progressed, shown as a percentage of the total time from when your job leaves its queue to when your output files appear in your output Amazon S3 bucket. You can set up CloudWatch Events to notify you through email if one of your AWS Elemental MediaConvert jobs fails. For a tutorial on setting up this CloudWatch Events event rule, see Tutorial: Setting Up Email Notifications for Failed Jobs. You can use COMPLETE events to programmatically receive the file name and location of the job's outputs. For more information, see Output File Names and Paths. You can set up CloudWatch Events so that a Lambda function initiates your post-processing code after your job finishes. For experienced cloud architects, see the Video on Demand on AWS post on the AWS Answers blog. For developers new to MediaConvert and Lambda, see the Automating MediaConvert Jobs with Lambda tutorial on GitHub. This tutorial is part of the Simple VOD Workflow series of tutorials on using MediaConvert to create video on demand (VOD). 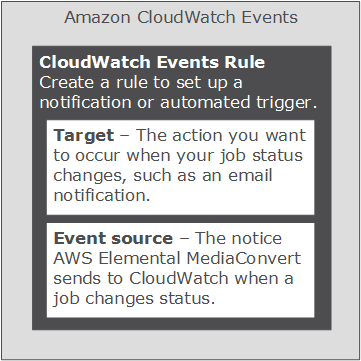 To set up CloudWatch Events, you create a rule that links MediaConvert and the service that responds to your job status change, such as Amazon Simple Notification Service (SNS) or AWS Lambda. The following illustration shows these two parts of CloudWatch Events rules. For more information about the events that MediaConvert can send in the CloudWatch Events event stream, see AWS Elemental MediaConvert Events.